Moss evolved after algae but before vascular land plants, such as ferns and trees, making them an interesting target for scientists studying photosynthesis, the process by which plants convert sunlight to fuel. Now researchers at the Department of Energy's Lawrence Berkeley National Laboratory (Berkeley Lab) have made a discovery that could shed light on how plants evolved to move from the ocean to land. A team of Berkeley Lab researchers led by Masakazu Iwai and Krishna Niyogi examined photosystem I, a complex of several proteins known as the "electron hub" for its role in photosynthetic electron transport. Using cryo-electron microscopy (cryo-EM), which allows an unprecedented level of resolution, they found the structure of the protein in a species of moss called Physcomitrella patens is different from that in other types of plants, such as algae and grass. Their paper, "A Unique Supramolecular Organization of Photosystem I in the Moss Physcomitrella patens," was published in the journal, Nature Plants. Said Iwai, the lead and corresponding author and a researcher in Berkeley Lab's Bioscience Area, "There's still a lot that's unknown about photosynthesis. This study may help us to understand plant terrestrialization, how plants evolved to live on land without aqueous conditions." Niyogi, a biologist and the corresponding author, added, "Adaptation of plants to the terrestrial environment was a huge and challenging step in the evolution of life on Earth, so it is important to understand the biological innovations and processes that allowed this to occur." What's more, improved understanding of how nature performs photosynthesis, which is responsible for nearly all of the primary production of biomass on the planet, can help scientists develop artificial photosynthesis, a scheme for producing fuel from sunlight, water, and carbon dioxide. 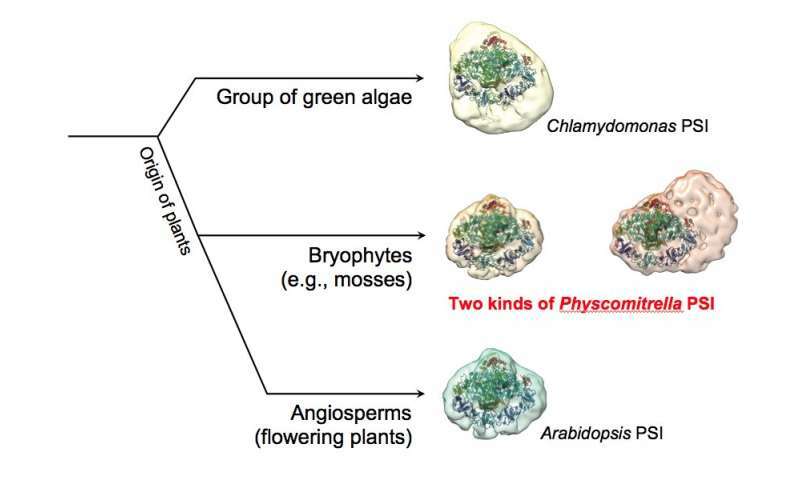 For the study, the researchers compared the structure of photosystem I in the moss with its structure in the small flowering land plant Arabidopsis thaliana, and in the green alga, Chlamydomonas reinhardtii. Specifically, they looked at photosynthetic light harvesting, which is performed by a "supercomplex" made up of two protein complexes, photosystem I and its light-harvesting complex proteins. Iwai worked with Patricia Grob and Eva Nogales of Berkeley Lab for the cryo-EM imaging, which allows researchers to get high-resolution images of the structure of the protein without having to crystallize or stain the sample. "Light is absorbed and transferred to the reaction centers of photosystems I and II with almost perfect efficiency, and this paper shows a unique arrangement of the pigment-protein complexes that accomplish this feat," Niyogi said. "The work has implications for the evolution of photosynthesis in plants, because the organism that we studied - Physcomitrella (a moss) - is a representative of one of the earliest lineages of land plants, so we can get a picture of what the light-harvesting antenna might have looked like during land plant evolution." Iwai of Berkeley Lab: "There's still a lot that's unknown about photosynthesis". The problem is that even now we are only appreciating what changes Nature itself has wrought upon the Biological Systems. It is high time that Researchers start endeavoring to convert non-photosynthetic unicellular organisms first and then simple coeleterates etc., into Photosynthetic ones. It should end only until Humans can Photosynthesize too. REMEMBER, We all STARTED in UNICELLULAR form on Day 0. Let it take 1 Millennium. What the heck. We will learn so many things during the process. In fact, there are already unicellular and multicellular ones those that both devour and photosynthesize for survival.